Five brilliant interns are working on very exciting projects at our ToThePoint offices and we're watching closely on their progress. Last week we’ve seen that our interns Robin and Lino managed to showcase a working VR version of our ToThePoint offices. The point is to train an office smart agent that can learn how and when to perform a task, in our case: empty out a trash bin. As you can see from this video, we’re still messing around in the VR environment. Next week we’ll unleash the office smart agent that has been updated to avoid all obstacles and find its way around the office without harming the passers-by. Brend is making great strides to set up CI/CD pipelines to automate his build and deployment processes. All this is quite new to him but the things he’s learning can most definitely be used in his later career and private life. This guy is one to watch out for, that’s for sure. Bert, IoT prodigy, has found a way to interlink his sensor data with Joris’ TurningPoint vehicle. 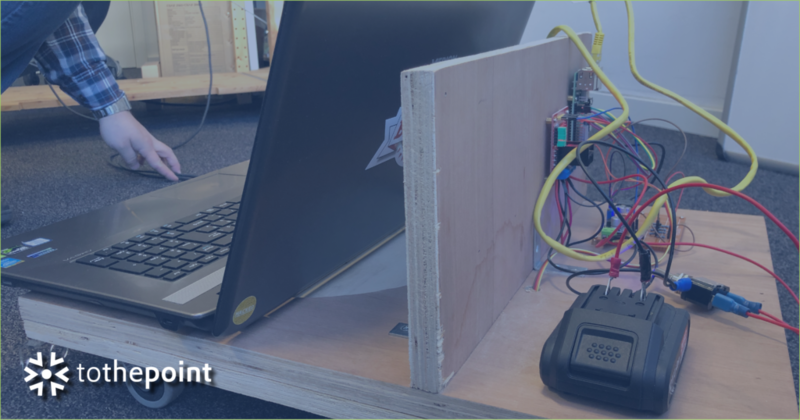 With the help of RFID tags the self-driving vehicle (that the guys from Office Smart Agent are building in VR — and Joris is building in real life), the TrashBeat sensors can soon flourish in our offices. Using Bluetooth beacons the self-driving vehicle will be able to triangulate its location and autonomously find its way to its designated spot where it will be parked after it has performed its task. Michael’s current state of affairs is still quite complex. Making steady progress in the pre-processing of his data, he’s testing variants of his neural network as to improve his current model.